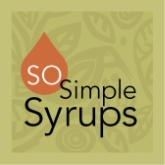 So Simple Syrups are the perfect way to bring the taste of fresh herbs and spices into craft cocktails and nonalcoholic refreshments, one glass or one pitcher at a time. I love craft cocktails and after years of experimenting at home I found that the best way to get a strong flavor from a subtle herb or spice, or to get heat from a pepper, was in a simple syrup. Once I settled on the recipes we liked most, I realized there was not room in our fridge to keep fresh syrups in all the delectable flavors I wanted on hand. To maintain the purity of the syrups and avoid preservatives that could impact taste, I began to freeze the syrups in 1 oz portions. The resulting product is delicious in craft cocktails, sparkling wine, or nonalcoholic refreshments like lemonade, iced or hot tea, and hot cider/chocolate. We now offer shelf stable 16 oz jars of syrups too, perfect for making pitchers to share.